Hello Everyone! This is my first post as a member of Best Creation's Design Team. 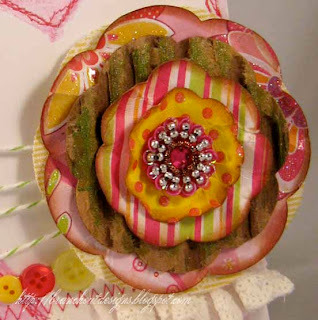 We are having our First Blog Hop of the new season today and our theme is "Creating Handmade Spring Flowers" On each blog you will find lots of incredible projects and ways to create and use spring flowers that you can make yourself! In order to win our Grand Prize be sure and collect the kinds of flowers made on each blog and send the list to teresa@bestcreation.us. Also be sure and leave comments along your way on each of our D.T.'s. blogs and especially on the Best Creation blog at the end of the hop. Be sure and check out the Best Creation Blog for the list of prizes you are going to win. I decided to pull out some flower dies from Spellbinders to make a layered die flower from a variety on Best Creations paper, cardboard and some fabric. 1. Die cut two large flowers, one from patterned paper and one from coordinating fabric. 2. Die cut a smaller die from cardboard and paint the cardboard with some Glimmerz. 3. Die cut two more smaller flowers from patterned paper. 4. Ink edges of all die cut patterned paper flowers and crumple flowers. Unroll and shape as desired. 5. Layer the flowers as shown here, pierce a hole through the center, and push a brad through to secure all components. Fibers: (White eyelet trim, Green and white baker's twine) May Arts. Accents: (Pink, yellow & green buttons) (Yellow, pink letter stickers) Best Creation. (Green letter Stickers) October Afternoon. (Flower center) Prima. Paint: (Pink and green) Glimmerz. Your stylish card is just perfect for Valentine's. Cheers! Just a lovely card and fantastic flower! beautiful love the flower! thanks for sharing! Oh I love your beautiful layered flower and your card is absolutely GORGEOUS!! 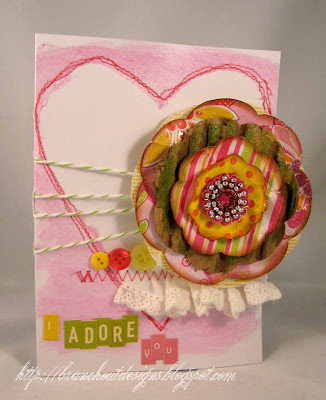 Love your layered card and all the texture! THanks for sharing this wonderful card and I hope you have an amazing day!! You card is amazing and I love the flower TFS! Love the flower, especially the bling. beautiful flower and adorable card! Fabric and paper? Wow! Nice efffect. Thanks for sharing! The flower is lovely, and I adore whatever you used in the centre. Sooo beautiful! such a cute little project! love the flower! beautiful flower! love the addition of the fabric and the Glimmerz! Love all your different layers!!! ooh the layers here are quite fabulous!! Love it! wonderful flower:-) must get some material! What a fun flower! TFS! love the beautiful layers and texture!!!!! Thanks for the inspiration! Love how this flower came out. Love the choice of paper. I haven't tried a flower with fabric yet, but this looks great. Such a fun and trendy card. LOVE, LOVE it! Love the layer of cardboard in here! Fabulous! 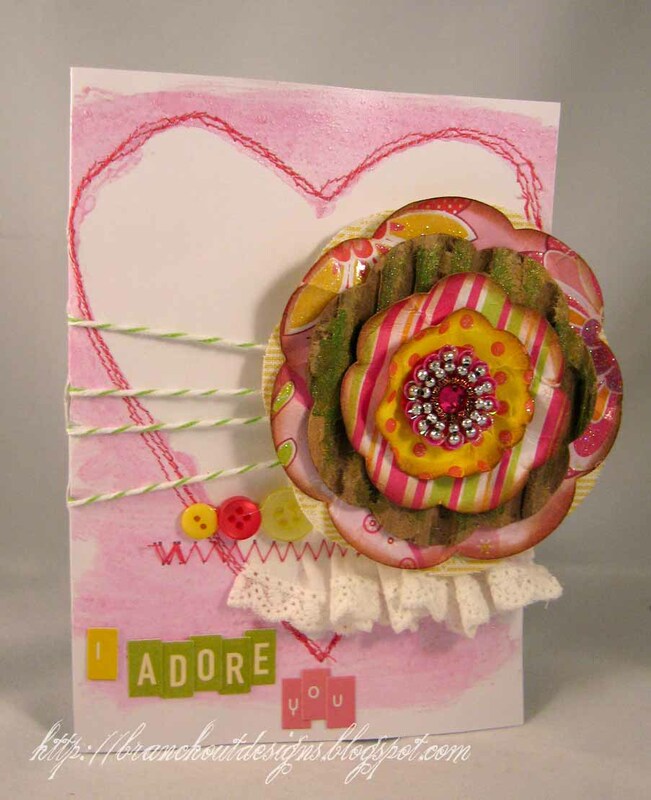 REally pretty card, and lovely layered flower. What a beautiful flower. I love how it looks with the heart behind it. I really like the combination of paper and fabric in this! That flower is gorgeous. I love all the textures you used, I wouldn't think to mix all those materials together in one element. So cute! Love the idea to use fabric. Thanks! I love the card and the colours in your flower is beautiful. Thanks for sharing. I love how you combined different papers and fabric, beautiful! Amazing use of colour, love your flower. Gorgeous card, love your flower! hOW VERY SWEET LOVE THE BOUQUET YOU GALS PUT TOGETHER THANKS FOR THE INSPIRATION FOR SRPING. Ooh TOTAL yumminess Emily! LOVE everything about it!! love your flowers! I don't have any spellbinders dies but maybe I can figure out something on my cricut with my gypsy. Thanks for sharing. I am a new follower. I hope you will visit my blog. What a great flower - love that it is really the focal point of the card and all the different textures! Beautiful. I love the texture. Thanks for sharing! love the colours you chose for this project, thanks for sharing! luv luv the heart and the details of the twine. Really cool card. The flower is so colorful! I'm loving this blog hop! TFS! Very pretty card and flower! Oh man!! What gorgeous layers!! Love the colors with the added fabric and cardboard!! Best Creations is one of my favorites. Congrats on the new design team! The card is wonderful. Your card is beautiful. I love all of the texture you have on the flower. Very nice.